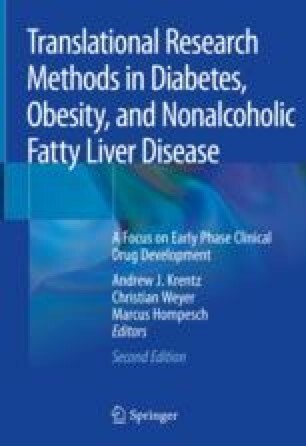 Impaired insulin action is a characteristic metabolic defect of obesity, type 2 diabetes and nonalcoholic fatty liver disease. Reducing obesity through non-pharmacological or pharmacological interventions improves whole-body insulin sensitivity. Drugs that directly enhance insulin sensitivity, the biguanide metformin and the thiazolidinediones, have been widely used in the treatment of type 2 diabetes. Other glucose-lowering medications may improve cellular insulin action via indirect mechanisms. The development of new insulin-sensitizing drugs requires robust and reproducible measurement of insulin action in humans. The hyperinsulinemic euglycemic clamp technique is widely regarded as the reference method for determining whole-body insulin sensitivity. Complementary techniques permit insulin action to be (a) partitioned between major organs and (b) broadened beyond glucose metabolism, e.g. to insulin lipid metabolism, vascular function.